Groundwater is found in two broadly defined layers of the soil, the “zone of aeration,” where gaps in the soil are filled with both air and water, and, further down, the “zone of saturation,” where the gaps are completely filled with water. The boundary between these two zones is known as the water table, which rises or falls as the amount of groundwater changes. 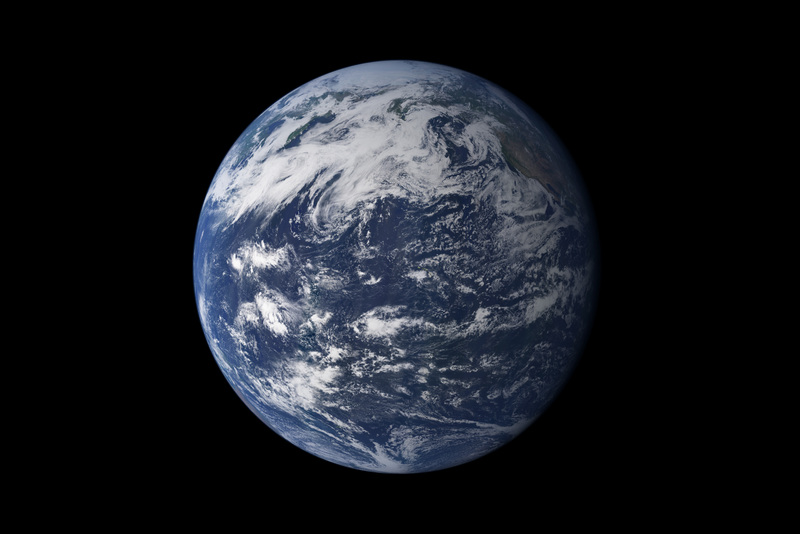 The amount of water in the atmosphere at any moment in time is only 12,900 cubic kilometers, a minute fraction of Earth’s total water supply: if it were to completely rain out, atmospheric moisture would cover the Earth’s surface to a depth of only 2.5 centimeters. However, far more water—in fact, some 495,000 cubic kilometers of it—are cycled through the atmosphere every year. It is as if the entire amount of water in the air were removed and replenished nearly 40 times a year. Water continually evaporates, condenses, and precipitates, and on a global basis, evaporation approximately equals precipitation. Because of this equality, the total amount of water vapor in the atmosphere remains approximately the same over time. However, over the continents, precipitation routinely exceeds evaporation, and conversely, over the oceans, evaporation exceeds precipitation. In the case of the oceans, the continual excess of evaporation versus precipitation would eventually leave the oceans empty if they were not being replenished by additional means. Not only are they being replenished, largely through runoff from the land areas, but over the past 100 years, they have been over-replenished: sea level around the globe has risen approximately 17 centimeters over the course of the twentieth century. Sea level has risen both because of warming of the oceans, causing water to expand and increase in volume, and because more water has been entering the ocean than the amount leaving it through evaporation or other means. A primary cause for increased mass of water entering the ocean is the calving or melting of land ice (ice sheets and glaciers). Sea ice is already in the ocean, so increases or decreases in the annual amount of sea ice do not significantly affect sea level. Throughout the hydrologic cycle, there are many paths that a water molecule might follow. Water at the bottom of Lake Superior may eventually rise into the atmosphere and fall as rain in Massachusetts. Runoff from the Massachusetts rain may drain into the Atlantic Ocean and circulate northeastward toward Iceland, destined to become part of a floe of sea ice, or, after evaporation to the atmosphere and precipitation as snow, part of a glacier. Water molecules can take an immense variety of routes and branching trails that lead them again and again through the three phases of ice, liquid water, and water vapor. For instance, the water molecules that once fell 100 years ago as rain on your great- grandparents’ farmhouse in Iowa might now be falling as snow on your driveway in California. Among the most serious Earth science and environmental policy issues confronting society are the potential changes in the Earth’s water cycle due to climate change. The science community now generally agrees that the Earth’s climate is undergoing changes in response to natural variability, including solar variability, and increasing concentrations of greenhouse gases and aerosols. Furthermore, agreement is widespread that these changes may profoundly affect atmospheric water vapor concentrations, clouds, precipitation patterns, and runoff and stream flow patterns. For example, as the lower atmosphere becomes warmer, evaporation rates will increase, resulting in an increase in the amount of moisture circulating throughout the troposphere (lower atmosphere). An observed consequence of higher water vapor concentrations is the increased frequency of intense precipitation events, mainly over land areas. Furthermore, because of warmer temperatures, more precipitation is falling as rain rather than snow. In parts of the Northern Hemisphere, an earlier arrival of spring-like conditions is leading to earlier peaks in snowmelt and resulting river flows. As a consequence, seasons with the highest water demand, typically summer and fall, are being impacted by a reduced availability of fresh water. Warmer temperatures have led to increased drying of the land surface in some areas, with the effect of an increased incidence and severity of drought. The Palmer Drought Severity Index, which is a measure of soil moisture using precipitation measurements and rough estimates of changes in evaporation, has shown that from 1900 to 2002, the Sahel region of Africa has been experiencing harsher drought conditions. This same index also indicates an opposite trend in southern South America and the south central United States. While the brief scenarios described above represent a small portion of the observed changes in the water cycle, it should be noted that many uncertainties remain in the prediction of future climate. These uncertainties derive from the sheer complexity of the climate system, insufficient and incomplete data sets, and inconsistent results given by current climate models. However, state of the art (but still incomplete and imperfect) climate models do consistently predict that precipitation will become more variable, with increased risks of drought and floods at different times and places. Orbiting satellites are now collecting data relevant to all aspects of the hydrologic cycle, including evaporation, transpiration, condensation, precipitation, and runoff. NASA even has one satellite, Aqua, named specifically for the information it is collecting about the many components of the water cycle. Aqua launched on May 4, 2002, with six Earth-observing instruments: the Atmospheric Infrared Sounder (AIRS), the Advanced Microwave Sounding Unit (AMSU), the Humidity Sounder for Brazil (HSB), the Advanced Microwave Scanning Radiometer for the Earth Observing System (AMSR-E), the Moderate Resolution Imaging Spectroradiometer (MODIS), and Clouds and the Earth’s Radiant Energy System (CERES). Since water vapor is the Earth’s primary greenhouse gas, and it contributes significantly to uncertainties in projections of future global warming, it is critical to understand how it varies in the Earth system. In the first years of the Aqua mission, AIRS, AMSU, and HSB provided space-based measurements of atmospheric temperature and water vapor that were more accurate than any obtained before; the sensors also made measurements from more altitudes than any previous sensor. The HSB is no longer operational, but the AIRS/AMSU system continues to provide high-quality atmospheric temperature and water vapor measurements. More recent studies using AIRS data have demonstrated that most of the warming caused by carbon dioxide does not come directly from carbon dioxide, but rather from increased water vapor and other factors that amplify the initial warming. Other studies have shown improved estimation of the landfall of a hurricane in the Bay of Bengal by incorporating AIRS temperature measurements, and improved understanding of large-scale atmospheric patterns such as the Madden-Julian Oscillation. In addition to their importance to our weather, clouds play a major role in regulating Earth’s climate system. MODIS, CERES, and AIRS all collect data relevant to the study of clouds. The cloud data include the height and area of clouds, the liquid water they contain, and the sizes of cloud droplets and ice particles. The size of cloud particles affects how they reflect and absorb incoming sunlight, and the reflectivity (albedo) of clouds plays a major role in Earth’s energy balance. One of the many variables AMSR-E monitors is global precipitation. The sensor measures microwave energy, some of which passes through clouds, and so the sensor can detect the rainfall even under the clouds. Water in the atmosphere is hardly the only focus of the Aqua mission. Among much else, AMSR-E and MODIS are being used to study sea ice. Sea ice is important to the Earth system not just as an important element in the habitat of polar bears, penguins, and some species of seals, but also because it can insulate the underlying liquid water against heat loss to the often frigid overlying polar atmosphere and because it reflects sunlight that would otherwise be available to warm the ocean. When it comes to sea ice, AMSR-E and MODIS provide complementary information. AMSR-E doesn’t record as much detail about ice features as MODIS does, but it can distinguish ice versus open water even when it is cloudy. The AMSR-E measurements continue, with improved resolution and accuracy, a satellite record of changes in the extent of polar ice that extends back to the 1970s. AMSR-E and MODIS also provide monitoring of snow coverage over land, another key indicator of climate change. As with sea ice, AMSR-E allows routine monitoring of the snow, irrespective of cloud cover, but with less spatial detail, while MODIS sees greater spatial detail, but only under cloud-free conditions. As for liquid water on land, AMSR-E provides information about soil moisture, which is crucial for vegetation including agricultural crops. AMSR-E’s monitoring of soil moisture globally permits, for example, the early identification of signs of drought. Aqua is the most comprehensive of NASA’s water cycle missions, but it isn’t alone. In fact, the Terra satellite also has MODIS and CERES instruments onboard, and several other spacecraft have made or are making unique water-cycle measurements. The Ice, Cloud, and Land Elevation Satellite (ICESat) was launched in January 2003, and it collected data on the topography of the Earth’s ice sheets, clouds, vegetation, and the thickness of sea ice off and on until October 2009. A new ICESat mission, ICESat-2, is now under development and is scheduled to launch in 2015. The Gravity Recovery and Climate Experiment (GRACE) is a unique mission that consists of two spacecraft orbiting one behind the other; changes in the distance between the two provide information about the gravity field on the Earth below. Because gravity depends on mass, some of the changes in gravity over time signal a shift in water from one place on Earth to another. Through measurements of changing gravity fields, GRACE scientists are able to derive information about changes in the mass of ice sheets and glaciers and even changes in groundwater around the world. CloudSat is advancing scientists’ understanding of cloud abundance, distribution, structure, and radiative properties (how they absorb and emit energy, including thermal infrared energy escaping from Earth’s surface). Since 2006, CloudSat has flown the first satellite-based, millimeter-wavelength cloud radar—an instrument that is 1000 times more sensitive than existing weather radars on the ground. Unlike ground-based weather radars that use centimeter wavelengths to detect raindrop-sized particles, CloudSat’s radar allows the detection of the much smaller particles of liquid water and ice in the large cloud masses that contribute significantly to our weather. The joint NASA and French Cloud-Aerosol Lidar and Infrared Pathfinder Satellite Observations (CALIPSO) is providing new insight into the role that clouds and atmospheric aerosols (particles like dust and pollution) play in regulating Earth’s weather, climate, and air quality. CALIPSO combines an active laser instrument with passive infrared and visible imagers to probe the vertical structure and properties of thin clouds and aerosols over the globe. Ahrens, C. (1994). Meteorology: An Introduction to Weather, Climate, and the Environment. St. Paul: West Publishing Company. Chahine, M. (1992). The hydrological cycle and its influence on climate. Nature, 359, 373-380. Lutgens, F., and Tarbuck, E. (1998). The Atmosphere: An Introduction to Meteorology. Upper Saddle River: Prentice Hall. Kundzewicz, Z. W., Mata, L. J., Arnell, N. W., Döll, P., Kabat, P., Jiménez, B., Miller, K. A., et al. (2007). Freshwater resources and their management. In M.L. Parry, O.F. Canziani, J.P. Palutikof, P.J. van der Linden, and C.E. Hanson, (Eds. ), Climate Change 2007: Impacts, Adaptation, and Vulnerability. Contribution of Working Group II to the Fourth Assessment Report of the Intergovernmental Panel on Climate Change (173–210). Cambridge: Cambridge University Press. Moran, J., and Morgan, M. (1997). Meteorology: The Atmosphere and the Science of Weather. Upper Saddle River: Prentice Hall. Parkinson, C. L. (2010). Coming Climate Crisis? Consider the Past, Beware the Big Fix. Lanham, Maryland: Rowman & Littlefield Publishers. Rosenzweig, C., Casassa, G., Karoly, D.J., Imeson, A., Liu, C., Menzel, A., Rawlins, A., Root, T.L., Seguin, B., and Tryjanowski, P. (2007). Assessment of observed changes and responses in natural and managed systems. In M.L. Parry, O.F. Canziani, J.P. Palutikof, P.J. van der Linden, and C.E. Hanson, (Eds. ), Climate Change 2007: Impacts, Adaptation, and Vulnerability. Contribution of Working Group II to the Fourth Assessment Report of the Intergovernmental Panel on Climate Change (79-131). Cambridge: Cambridge University Press. Schneider, S. (1996). Encyclopedia of Climate and Weather. New York: Oxford University Press.